one and the same day? So I’m writing this after a Saturday that was not quite what we had hoped for. All things being equal however we should get to go to one more soccer match this season and see Watford promoted through the play-offs instead of automatically. What a horrific game to watch with Jonathan Bond seriously injured by a Watford player Ikechi Anya after a deliberate push by on him by a Leeds player. Sheer nerves gave away two unfortunate goals (sadly it was Jack Bonham’s first appearance as keeper for the first team after the injury to Bond) and we now have to do it all again with possibly only a rookie keeper. Ah well. First disappointment was to discover that you can’t actually visit the Imperial Palace except on two days of the year. 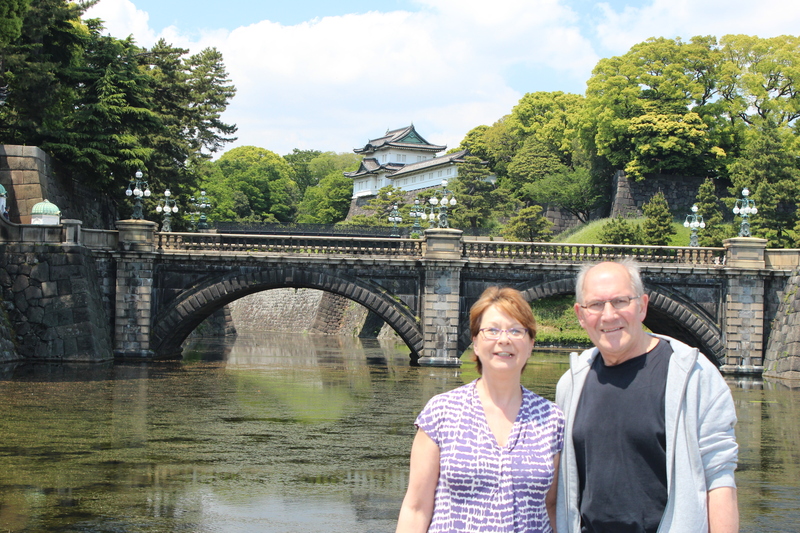 We had been hoping to have a touristy morning starting with a trip across town to Tokyo Station and then a stroll to the Palace gardens at least. 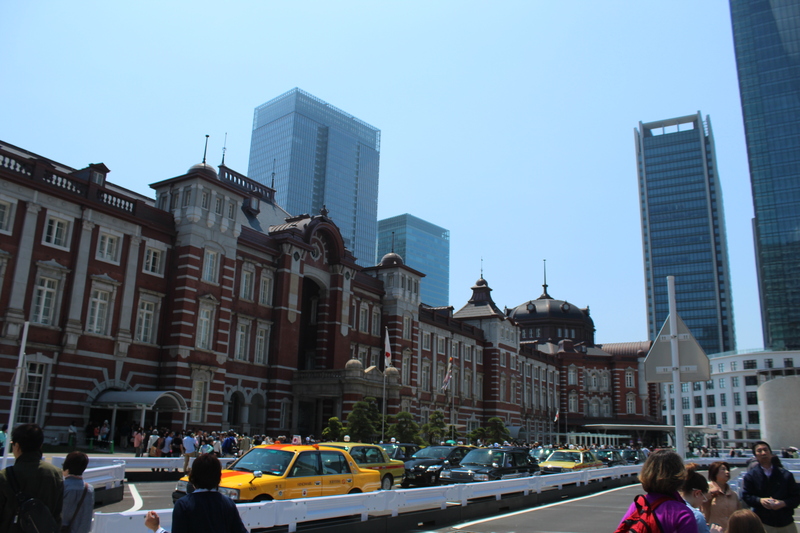 Well Tokyo Station which we’d only ever seen from inside is a true delight of a building and an exhibition was being held to celebrate its twinning with Grand Central in New York and its centenary next year – a year after Grand Central. Outside – after the traffic control crash barriers and so on – there is a great open space with fountains and granite benches. Granite is cut and polished so beautifully throughout Japan as seating and ornamentation in public spaces, as indeed is wood. 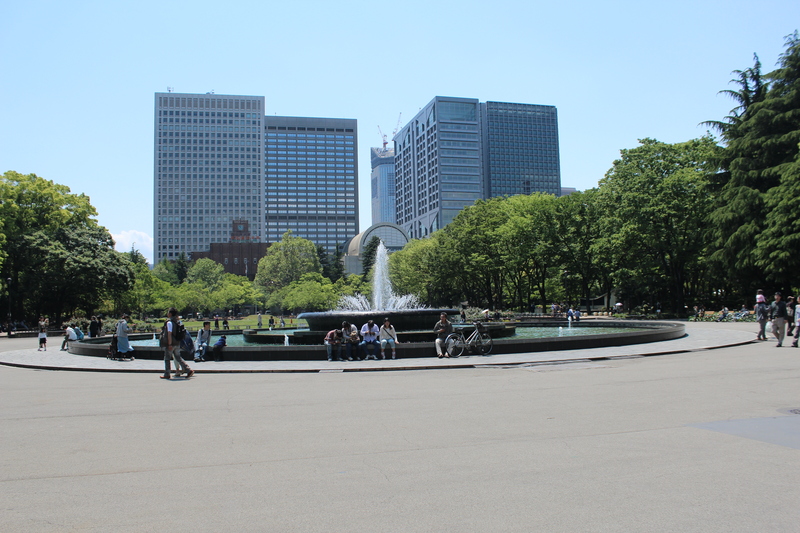 We made our photostop at the point where you can glimpse an outbuilding above the impressive high walls and wide moat and then crossed over to the first surprise and delight of the day – Hibiya Park – forty acres of endlessly changing green spaces right in the heart of the government and business district. It was Japan’s first European style park and opened as such in 1903, having previously been a military manoeuvre and parade space for the shoguns. From the first little hill we encountered with its replica of Philadephia’s Liberty Bell, past tennis courts, rose gardens, lawns, lakes, fountains and performance spaces the park revealed its clever landscape. 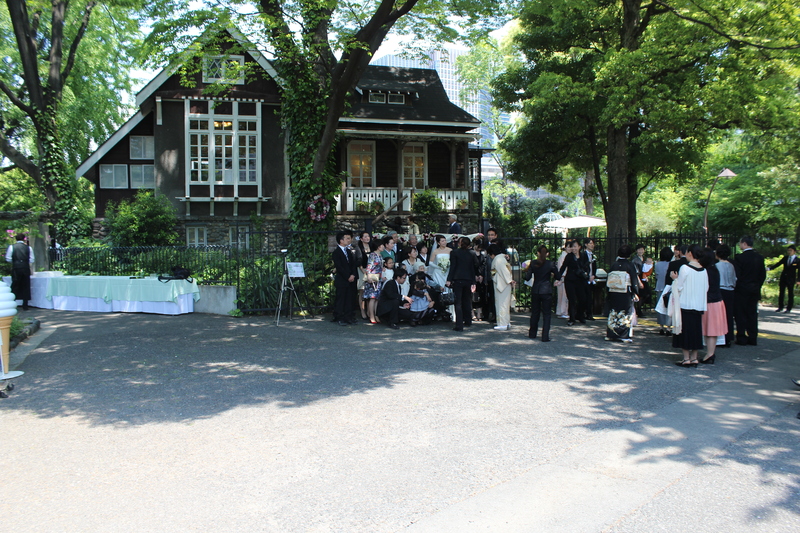 It’s an obvious venue for glorious wedding photography as we saw and has a hint of Central park. From time to time you would see cars driving around the perimeter but noiselessly in that weird sound barrier parks can sometimes erect. 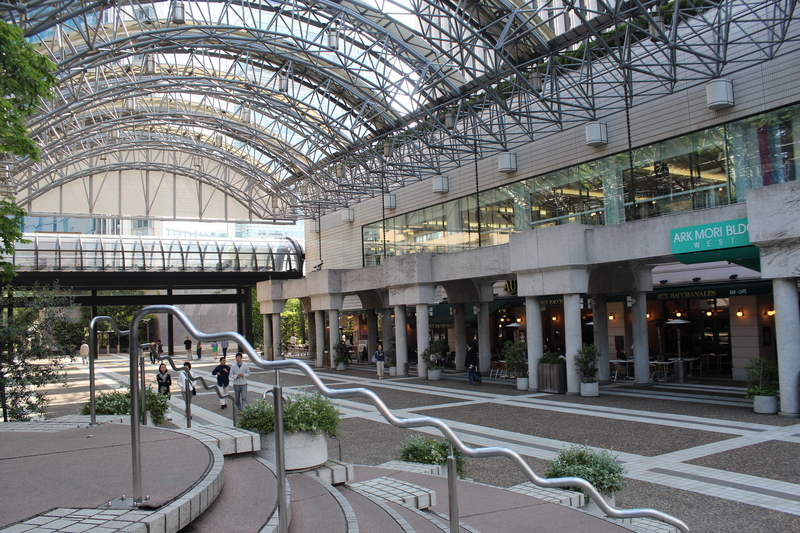 We next caught the subway to Akasaka to look for a number of key locations in several Murakami books. 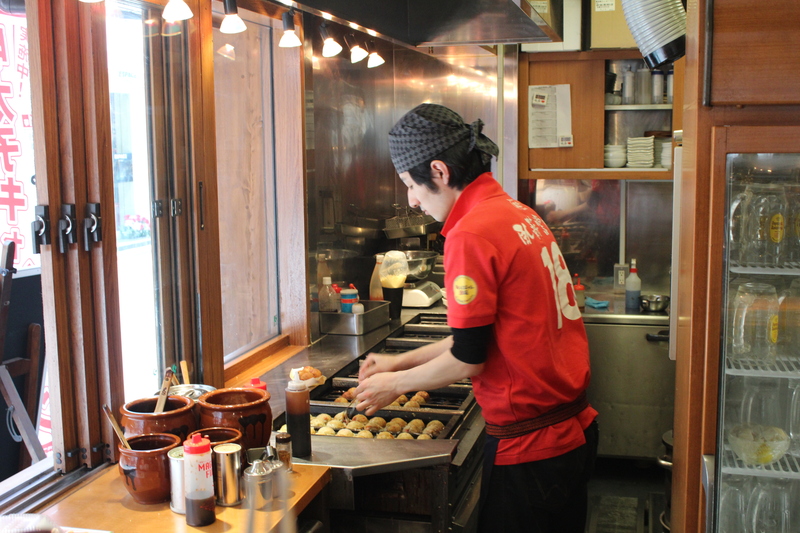 However it was time for lunch first which after inspecting several back street establishments behind the station we elected for a stand-up bar where the only offer was tako yaki octopus balls – precision grilled by the chef and served by a smiling host. They needed careful consumption as the interior was volcano hot. They came with a choice of three toppings and were delicious – excellent serendipitous street food. 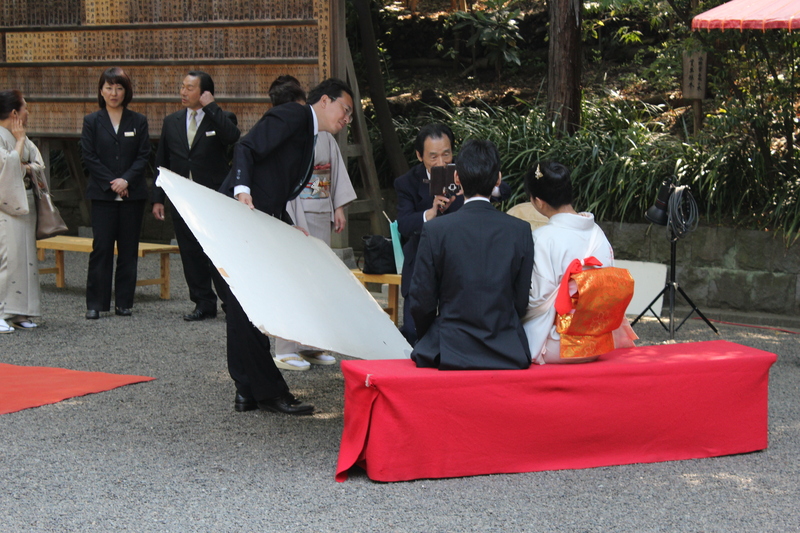 Then off to the police station, the Nogi Shrine and Park – yet more ceremonial photography – and some streets on the Akasaka-Roppongi boundary. 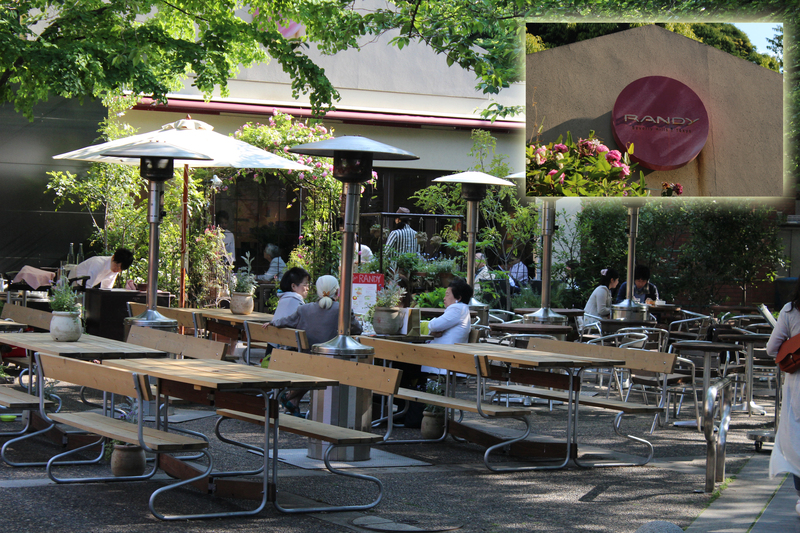 A brief stop was in order at a smart cafe near Suntory Hall called “Randy, Beverly Hills and Tokyo” which also had a display of tempting craft items on sale. The Ark Hills development here is stunning with apartments, offices, concert halls, open spaces and of course shops and cafés. 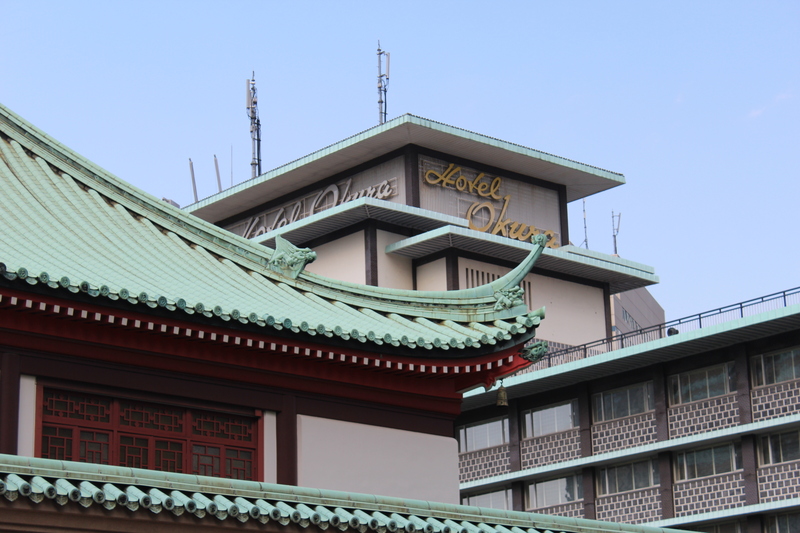 Then finally we set off for the Hotel Okura where heroine (?) Aomame undertakes a seriously important mission in 1Q84. It also happened to be where I stayed in 1979 and 1981. Funny how when the Japanese Government is paying you get to stay in a top hotel at a current rate of £250+ a night and enjoy its facilities but when it’s on your own personal budget the Sunroute Plaza Shinjuku seems perfectly adequate. My recollections of a really chic, smart hotel were dashed by the exterior which is unprepossessing to say the least. The vast lobby is unchanged and the pink clad elevator attendants are as I remembered them. There was a bonsai exhibition as part of a bigger gardening show. Now neither of us are great enthusiasts but these were truly works of art with their shaping – perfect cones, leaning layers or cascades. Back to the hotel to change and off to Roppongi to watch the sad game of football and eat chicken wings, ribs and fries which I’m afraid to say felt totally alien after only three weeks away. 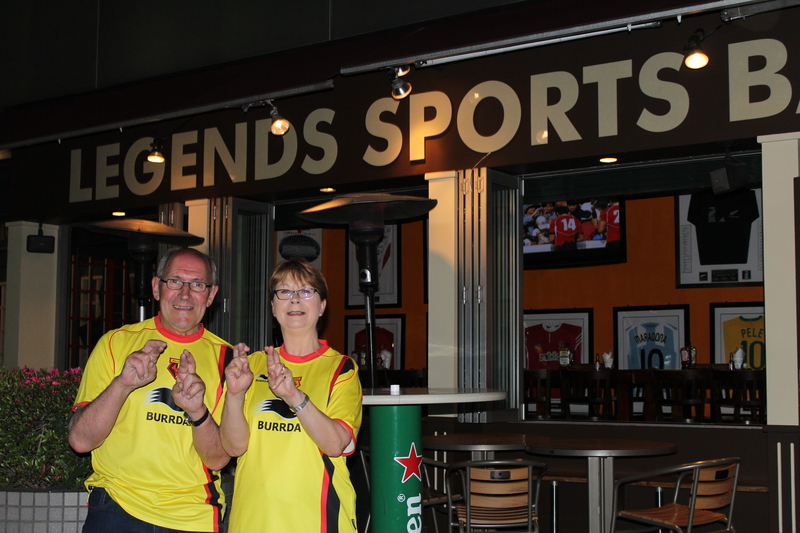 The staff kindly assisted in our efforts to raise the Orns but you know what happened. Sunday started with a lengthy browse around a flea market at the Hanazono Shrine which we had visited on our first day in Tokyo. Lots of kimonos, jewellery, fans, prints, household objects and the usual mix of real antiques and not-so-real “antiques”. 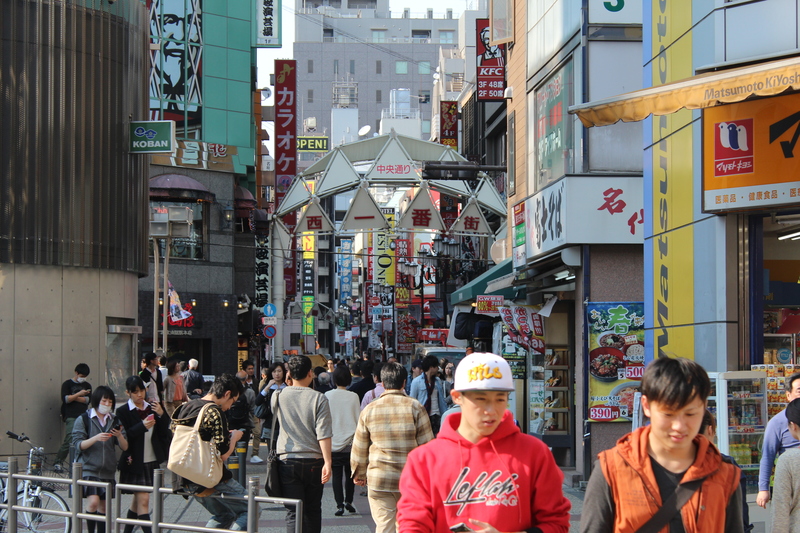 A few small purchases were made before we took the subway north to explore Waseda University where Murakami studied. It had a real Oxbridge/Ivy League feel and wandering between buildings old and new in a mixture of expressive and utilitarian architecture which, as at so many universities, reflects the periods in which construction took place. 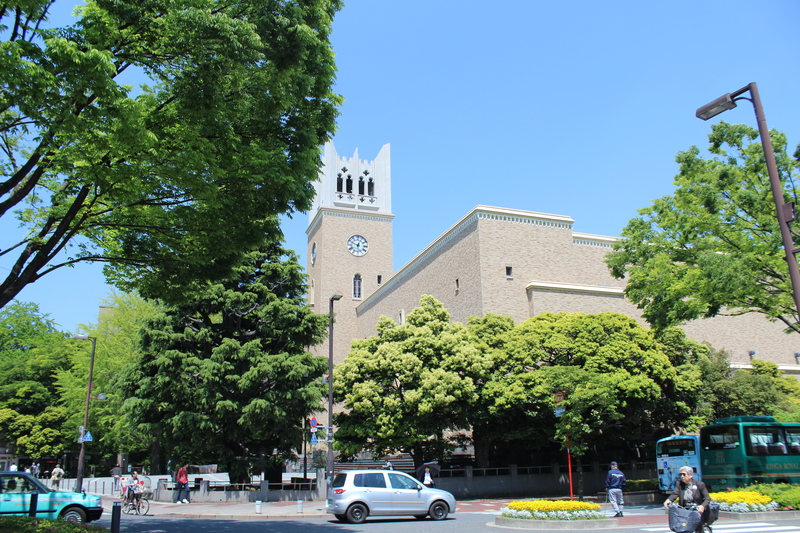 Many people are also of the opinion that Waseda is the model for Toru Watanabe’s unnamed university in Norwegian Wood so it was interesting from that point of view as well. 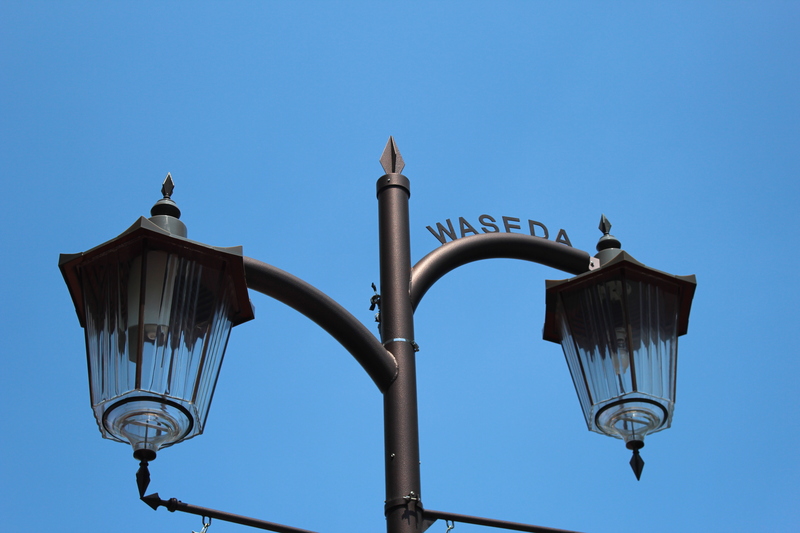 Next big question: where to get lunch in Waseda on a Sunday with few places open in this classy suburb. We got lucky by penetrating the blue curtains of a sushi bar where a venerable chef prepared a plate of superb authentic sushi – no extra wasabi was even hinted at. They also very kindly recharged my camera battery as we ate. Such service. A scampering afternoon of visits to Ikebukuro to find the Traditional Japanese Crafts Centre only to discover it’s relocated to Aoyama. 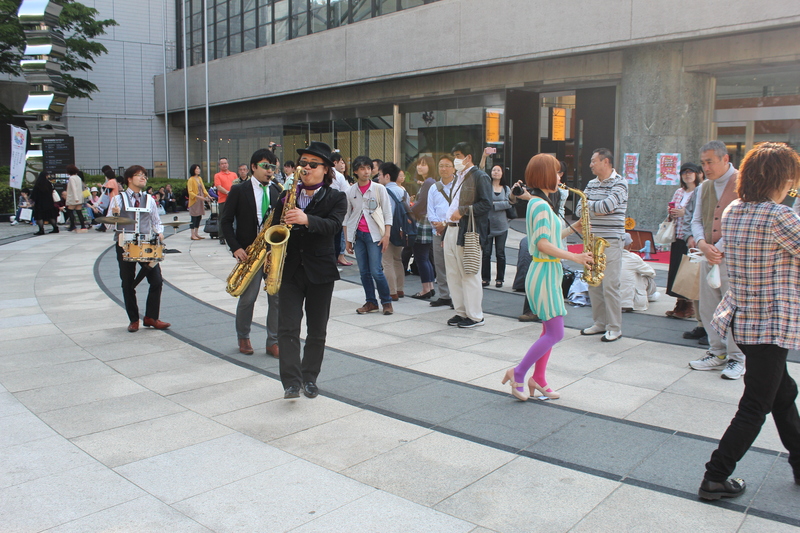 So we enjoy briefly the mad atmosphere of Ikebukuro with stilt walker, performance artist, pavement painter and jazz combo – just like being in Covent Garden then off to Aoyama where the boulevard features in several of the novels and we do find the craft centre which holds a wonderful display of regional work from all over Japan. A great collection but a little on the expensive side for our pockets, if not our taste. 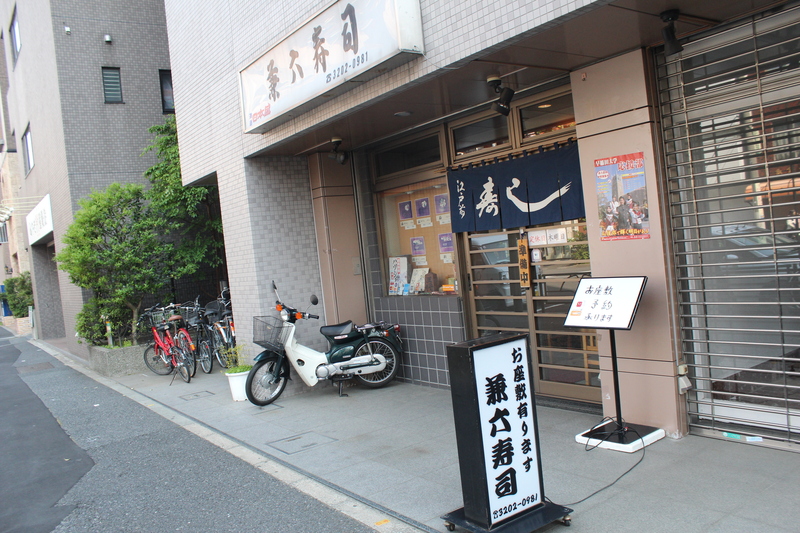 Another domestic early evening at the coin op laundry in the basement, map finding and precision timetabling for tomorrow’s planned trip to Chiba Art museums and Kamakura and then dinner in a restaurant Maimon not far from the hotel. As well as some delicious yakitori with leeks we had a dish new to us bagna cauda which was fresh raw vegetables which you dip into a fondue-like bowl of a sauce consisting of soy, garlic, milk, sesame and anchovies – oishigatta as we say repeatedly – and so good for us too. Next Next post: Not enough time … there’s a surprise!